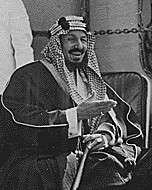 Abdul Muhsin bin Abdulaziz Al Saud (Arabic: عبد المحسن بن عبد العزيز آل سعود‎‎) (1925 – 10 May 1985) was the governor of Medina and member of House of Saud. He was one of the leading poets in Saudi Arabia, and a lover of literature, poetry and historical books. Prince Abdul Muhsin was born in Riyadh in 1925. He is the thirteenth son of King Abdulaziz with his wife, Al Jawhara bint Saad Sudairi, member of the Al Sudairi family. His full brothers included Prince Saad and Prince Musaid. Prince Abdul Muhsin studied at the school of princes, and memorized the Quran and learned horsemanship, and then completed the history, politics, arts of war. Abdul Muhsin was the a highly regarded former governor of Madinah Province between 1965 and 1984. He was interior minister in King Saud's cabinet in 1961. Prince Abdul Muhsin supported the Free Princes Movement, led by Prince Talal. He had a reputation as being relatively liberal. During his governorship, the television station opened and highways were built to help people to reach to the Prophet's Mosque. Abdul Muhsin married eight times and had 12 children. His son, Saud, is the governor of Hail province. Abdul Muhsin died on 10 May 1985 in Riyadh's King Faisal Hospital, suffering from illness at the age of 60. 1 2 3 "Prince Abdul Mohsen, Saudi Governor, Dies". The New York Times. Medina. 12 May 1985. Retrieved 6 August 2013. 1 2 Joseph A. Kechichian (3 August 2001). Succession In Saudi Arabia. Palgrave Macmillan. p. 283. ISBN 978-0-312-29962-0. Retrieved 20 March 2015. 1 2 "Prince Abdul Mohsen bin Abdulaziz, 60, a brother of King...". Orlando Sentinel. 12 May 1985. Retrieved 8 May 2012. ↑ Islam Yasin Qasem (16 February 2010). "Neo-rentier theory: The case of Saudi Arabia (1950-2000)" (PDF). Leiden University. Retrieved 13 May 2012. ↑ Henderson, Simon (14 September 2009). "Saudi Sucession--a Desert Legacy". The Cutting Edge. Retrieved 3 April 2013.